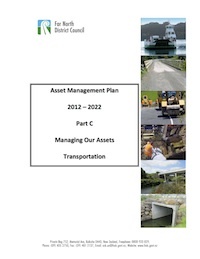 The Far North District Council – Asset Management Plan 2012-2022 is available here. This document describes the process for managing assets for the Far North District Council of New Zealand. For each asset type, the plan summarizes the current condition and performance of the assets, in addition to a description of the measures used. The system level of service has also been measured. The document ends with an Improvement Plan that incorporates asset management principles into the planning process. The improvement plan is divided into improvement tasks, with descriptions, priority ratings, and responsibility. The Far North District Council also performed a gap analysis, to determine the priority for 3- and 5-year targets. Future demand, financial projections, risk management, and a routine maintenance plan were also considered in the AM plan. This document includes the following sections: Asset Valuation, Communications and Reporting, Data Management, Environmental Sustainability, Financial Plan, Future Demand, Introduction, Inventory and Condition, Levels of Service, Objectives and Measures, Process Improvements, Regulatory and Legislative Requirements, Risk Management. The modal scope of this document is: Multimodal.